•Available in 12, 16, 18 & 20L/min hot water delivery (at 25°C rise). •Compact 520mm(H) x 350mm(W) x 160mm(D). •Flamesafe® overheat protection — shuts down the water heater before overheating can occur. •Electronic remote temperature controllers — for accurate setting of the ideal, safe temperature for bathroom and kitchen. 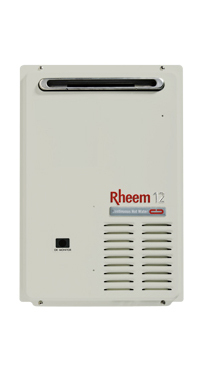 •Rheem Q Factor™ — ensures rapid hot water every time, with none of the fluctuations that occur with some continuous flow units. •Extra safety — 50°C temperature limited models available. •Natural gas and propane models available. •10 year warranty on heat exchanger*. •10 year parts & 3 years labour on heat exchanger*. •3 year parts & labour warranty on other components, for domestic (non-commercial) installations only*.